Situated just 12 miles from the city, Bicester is a beautiful and historic town dating back to Saxon times. 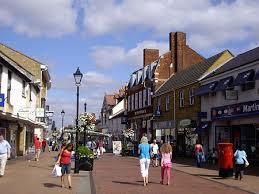 Today Bicester offers the visitor a slice of history combined with all the modern facilities you could want. A quaint market square is overlooked by elegant 16th Century buildings, why not grab a trail guide from the tourist information and follow the historic trail to discover the colourful history of this lovely town. Bicester Village shopping outlet offers up to 100 stores selling a wide range of big name goods such as Mulberry, Hugo Boss and Wedgewood as well as a range of places to enjoy a bite to eat or sit down for a coffee. If the outdoors is more your thing then the spacious Garth Park offers a lovely green space in which to enjoy a year round programme of events including a Proms night and a Jazz Festival. Surrounded by beautiful countryside, Bicester is ideal for walking, cycling, golfing or simply exploring. Situated in the beautiful county of Buckinghamshire, Hog Roast Bicester are your first port of call if you are thinking of hosting an event of any kind. Our hog roast hire makes the ideal choice when it comes to entertaining a crowd. A real cost effective solution, Hog Roast Hire Bicester can supply everything you need for a fuss free party or event of any size at any time of year. With over ten years experience, the team at Hog Roast Bicester can source, supply, set up and clean down at any event including weddings, birthday parties, christenings, beer festivals, music gigs, carnivals and festivals. 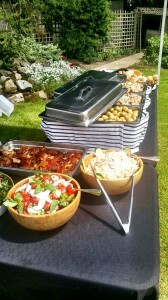 A hog roast offers a fuss free, mess free and affordable solution when it comes to feeding a crowd. 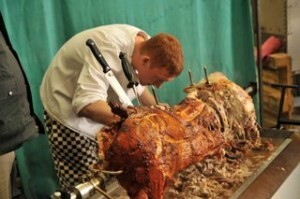 Hog Roast Hire Bicester offer a quality service built on years of experience. Whatever your event, our team are on hand to offer all the advice and support you need. We can help you get the best value for money by choosing the right size of meat joint, the right quantity of accompaniments and help with venue choice and bookings. Hog Roast Bicester use only local suppliers who use ethical farming methods to supply the freshest quality meats, raised by the highest standards of animal welfare. Your roast of choice if delivered fresh to your venue on the day of your event and our team will set up your hog roast machine. It is then just a case of simply lighting the fire and allowing several hours for your hog roast to take care of its self. The meat simply turns slowly over the naked flames leaving you free to enjoy your event with your guests. After hours of slow cooking you will be rewarded with the juiciest and tenderest of meat along with the crispiest of crackling to carve, serve and enjoy. Not only does a hog roast make a stunning and impressive centrepiece to any event, imagine the delicious aroma of roasting meat drifting past your guests, a mouth watering prospect! When it comes time to serve, simply carve, pile into soft bread rolls and top with your choice of accompaniment… hot rich gravy, fruity apple sauce or maybe traditional stuffing? What’s more, Hog Roast Hire Bicester can supply everything you need from simple paper plates and napkins, to silver cutlery or right through to a fully catered service with trained chefs and service waitresses to carve and serve your guests. We understand it is your event and our dedicated team will work together with you to meet all your requirements within your budget limits. From 5 to 500 people there couldn’t be a more simple, fuss free solution. We recently catered at an event at a beautiful house in Bicester with a magnificent garden where we set up our machine and began to prepare for the day ahead. The event was a surprise 25th wedding anniversary organised by the couple’s lovely children. With 150 Guests we were sure to have our work cut out with the menu they had opted for. It was the perfect day for it with the sun shining brightly. The guest’s turned up early as expected at a surprise party and were greeted with lovely canapés much to their delight. As the couple arrived they were me by a huge cry of “SURPRISE!” Two main courses were chosen for the event, which were spit roasted Pig served with apple sauce, stuffing & crispy crackling or spit roasted spring Lamb seasoned with rosemary served with mint and a mustard & dill Sauce. Both were accompanied by a choice of three freshly prepared salads and some warm new potatoes in herb butter. Once finished, our waiting staff quietly and efficiently collected up the empty plates and readied the desserts. They had opted for a choice of the perfectly fitting Summer Pudding which consisted of summer berries set in their own juices and enveloped by soft white bread and our handmade individual dark and delicious chocolate tortes, with a light crunchy base. To be thanked for our service in a speech made by the son was the perfect way to end the day! At the end of your event, our team will attend your event to carve any remaining meat, clean down and clear away, leaving no mess or washing up for you to do. Hog Roast Hire Bicester take all the hard work out of catering any event, we can supply marquees of any size, catering staff and more. A full range of menus are available including our very popular ‘Buffet’ option where we supply a range of roasts such as pork, lamb and beef as well as a vegetarian choice. A full range of salads, pasta, breads and tempting desserts are also served and your guests are free to help themselves to whatever they fancy. With so many options, Hog Roast Bicester can offer a truly bespoke service, why not contact us today to discuss your event or with any questions you may have.